Self-examination requires honestly. There is nothing more honest to me than the mirror. I can convince myself I feel like I’m 20 years old. I can still picture myself in my twenties. I can even prove to you I’m stronger and fitter than I was when I was 20. However, if I hang out with teenagers, while I still may fool myself into thinking I’m still young, they remind me I’m not as young as I feel. But one thing I can’t argue at all is what the mirror says. When I pull out the mirror, the rude awakening of facing my image in the glass reflection, the wrinkles and grey hairs, are brutally honest – telling me I’m no where near 20 anymore. Unfortunately, many people do not look at their life honestly. They look at their life more relatively. For instance, they may feel pretty fit compared to their out of shape family. Or, someone may feel like they eat really healthy compared to all their pizza-loving, beer-drinking friends. True self-examination requires open eyes and a clear view of one’s real self, compared to the healthiest, happiest, best version of your own self – not compared to someone else’s hot mess. Another words, don’t fool yourself. Rate yourself with a clear head and clear judgement. Ironically, even if we know we have stuff to work on, it’s easy to think more highly of ourself than we should. No one likes to feel like a failure, but this isn’t about feeling like a failure, this is about simply improving. But, many times, in order to feel better about ourself, we are too busy pointing out everyone’s mess to recognize our own areas of weakness. It’s the proverbial plank-eye scripture. The best way to look at yourself is to look at you now compared to the younger you, the best you, the you God desires you to be. If it was just you and God alone, what are the areas you think He’d want you to work on? Would he wish you’d take better care of your body? Maybe He’d like you to spend more time with Him or be a better spouse. Whatever it is, you must remember you are your only competition. If God had the chance to sit me down, I doubt very seriously He’d do some name dropping. He’s not going to say, “Bonnie, you are doing OK, but have you seen Kristie lately? That’s who you need to be more like”. No way! It would just be about me and Him – so keep your eyes on your own paper during your self-examination time. Remember my quote saying “I will beat her”. 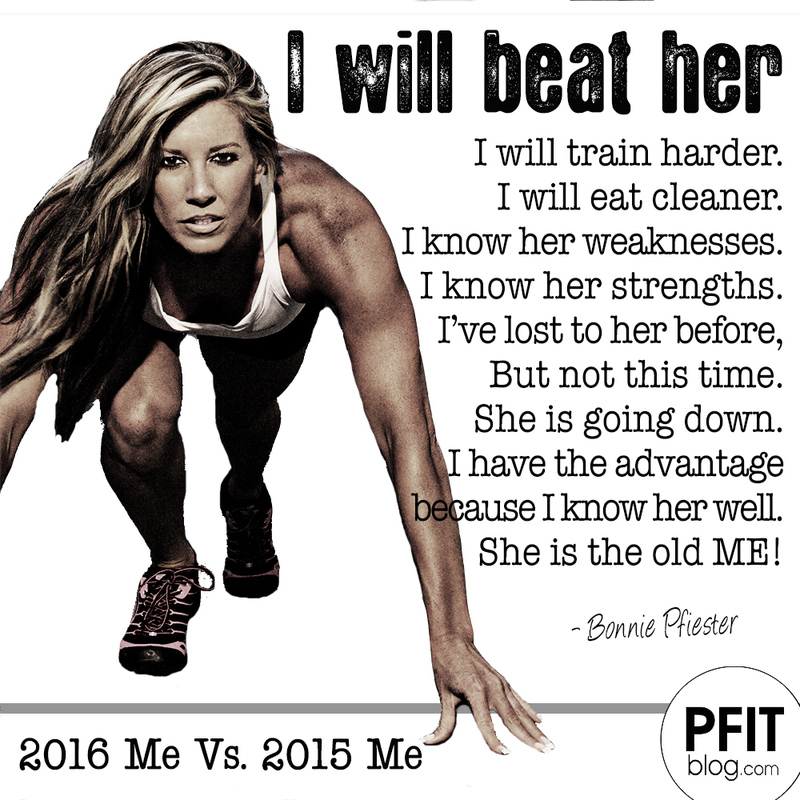 This year, I want to beat the old me. That’s the only person I want to beat. Now, if you are ready to begin this journey to a new you, then here are the steps to making 2015 your very best yet! 1. Examine yourself – both good and bad. Make a list of your weak areas that need strengthening and make a list of your strengths too. 2. Set annual goals – both broad and specific. 3. Set monthly goals – set a goal just for January and focus on that goal the most. 4. Set weekly goals – set the goals needed each week to help you meet your monthly goal. This can be a set number of days you want to workout a week or how many pounds a week you want to lose. Weekly goals should be easily maintainable and help you stay on track. 5. Set daily goals – Daily goals may be centered on a new daily habit, like going to be early, or sticking to a specific daily caloric budget. Daily goals are necessary in reaching your weekly goal. 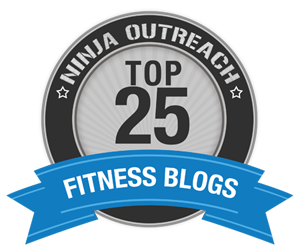 Don’t forget to subscribe to my blog if you want daily New Year Motivation this month! awe! Thank you!! <3 See u soon! !